Every so often, I like to look at an artist that influences how I paint, or how I think about painting. American Realist, Andrew Wyeth, is one such artist. Wyeth’s somber exploration of rural places strikes a chord with me. It is almost as if he is painting the present knowing full well that it is already the past when he lays down his last stroke. Critics have called him sentimental, but I am not sure that is entirely a criticism. To recognize and value the ephemeral, is to see things for what they are at this moment and to accept them. Born in 1917 in Chadd’s Ford, Pennsylvania, Wyeth was the son of noted illustrator N.C. Wyeth. Due to ill health as a child, Wyeth, did not attend school, but was tutored and studied art with his father. Wyeth was conscious of heritage both natural and familial. The places he painted – the farms at Chadd’s Ford and Maine – were a representation of that. He read Thoreau as a child and was constantly aware of the cycles of life and our place in Nature. His father died when he was in his twenties and it had a huge impact on his view of life and his art. 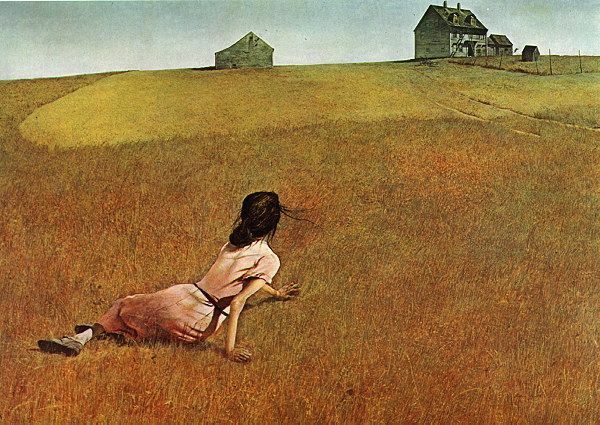 His most well known painting is Christina’s World (above), painted in 1948. Christina Olson was a neighbour of Wyeth’s in Maine. The story is told in subtly coloured realism that is richly emotive. Christina suffered from a lower body paralysis that made getting around extremely difficult for her. The ‘longing’ for the house is suggested by the vast distance away that it appears to be. 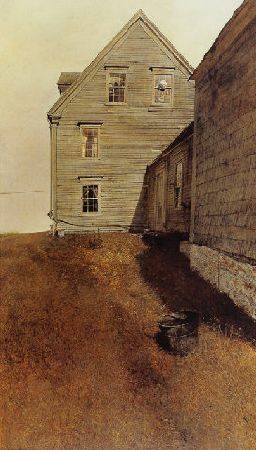 Wyeth appears to be as comfortable with buildings as his characters as people. The house in the background, Olson House, was painted hundreds of times by the artist. Originally built in the 1700’s by Captain Samuel Hathorn II, the house remained in the the original family until Christina died in 1969. I wanted Weatherside to be a true portrait of the house – not a picturesque portrait….because I knew this house couldn’t last….I had this feeling that it wouldn’t be long before this fragile, crackling-dry, bony house disappeared. In my own paintings I explore the old houses, sometimes in a derelict or ruined state. It is this very ephemeral nature of these places that I seek in each piece. Here in Ontario, there are many places that have passed into history – and some that will be rushed there by the harshness of recent winters. My painting of Wheat Field Ruin from back in May looks at a derelict house from down a hill. Clearly, it will not be long before the old house disappears. In the painting I tried to suggest the motion of the observer, leaving it behind both literally and figuratively. Most certainly Wyeth has had an influence on how I portrayed the house characters and their landscapes in the series I have been developing this past year. In retrospect, after a year of change and loss, I think I might better understand what my heart – and perhaps Wyeth’s – had already known. I love the paintings of Andrew Wyeth, his work was also a great influence on me. However my attempts at dry brush were a complete disaster. I wrote a post on him as part of My Favorite Artists series back in December. Michelle, Thanks for sharing this post on Andrew Wyeth. Very interesting. Wheat Field Ruin is very poignant and one can see the influence in this piece. I enjoyed the information on Andrew Wyeth…I’m not “up” on my artists, but I do know what catches my eye. I think sentimental is a good thing for a painter to be…makes for moving works of art! Your Wheat Field Ruin is beautiful the lush new field with the decrepit house…deliberate contrasts in life! As a painter I never connected with watercolor. I found it the most difficult medium i approached. In fact I put it in a box labeled ‘for tacky landscapes’. In the 90’s I went to the Museum of Art in Boston. They had a floor dedicated to the Wyeth’s and Prendergast etc…this was the first time i really ‘saw’ watercolor for what it is. The ability to create luminecent if not ethereal images was a wonder to me. and with such economy of paint. Lot’s of white space and the translucent quality of the works was an ‘epiphany’ for me. Terry – I never had much success with dry brush either! I think what hit me most was less the medium and more his composition style. Working in acrylic – I feel like a hybrid at times! Yes – exactly, Heather! I tend to be more ‘duel’ in my approach to the cycle of which I spoke…. Eddie – I have yet to see one live, so the subtlety of the media is lost on my. 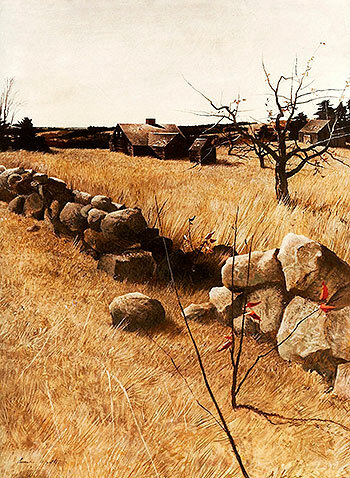 Wyeth reaches into my poetic soul with his subject matter and the light he obviously achieves. I am glad you enjoyed the post! Very interesting post! Makes me wish my own stuff were more realistic, but I guess that’s just not my style. We must be what we are, Lana! Very instructive post Michelle and beautifully illustrated. I love the first image. As I read of his passing this morning, I came back to your blog post. What an amazing man. He was 91. Peace. Jean – He was. 91 was not too bad though! Altogether superb skript you possess! Punctilious theme more than all and very resoursful portal! Momentous job admins!